Are you looking for effective tools to boost the body’s natural healing ability? JIKIDEN REIKI gives you the skills to engage the body’s amazing natural capacity for healing. Reiki in its original Japanese form: pure, simple and effective. The training is clear and comprehensive, giving you the tools to use this simple hand healing modality on yourself and on others with confidence. Tadao Yamaguchi is the head of the Jikiden Reiki Institute in Japan. His mother Chiyoko learned Reiki from one of the original teachers, Dr. Chujiro Hayashi (a trained medical doctor and Navy officer). Together they founded the Jikiden Reiki Institute with the intention of spreading authentic Japanese Reiki, and Tadao Yamguchi has been working tirelessly ever since to help people worldwide discover authentic Japanese Reiki as an effective natural healing method. For information on the course syllabus click here. is only available to candidates who have completed their Jikiden Reiki training and meet a number of strict criteria and requirements, including sufficient treatment experience (120 hours on 40 different clients). There is no fast-track to becoming a fully qualified Jikiden Reiki teacher. Hand Healing? Are you serious? Do you already practise Reiki, or are you a Reiki Master? This article explains why Jikiden Reiki may be of interest to you. What makes Jikiden Reiki training special? Practical, treatment focused training, allowing unique insight into the cultural and spiritual roots of Reiki practice. Simple, practical healthcare tools to support yourself and others. Ongoing local support from teachers to help develop skills and confidence. Suitable for complete beginners and experienced Reiki practitioners. The Jikiden Reiki curriculum is likely as close as it is possible to get today to how the founder of the practice, Mikao Usui, taught. Original Reiki, nothing added nothing changed. Passed on in its original integrity. A global supportive community of practitioners. Students are accredited by the Jikiden Reiki Institute in Kyoto, Japan. Places are limited. You can secure your space by requesting an Institute approved booking form from the course organisers and paying your non-refundable deposit. Since Jikiden first came into my life 7 years ago, I think it is fair to say that I have benefited from and been changed by the practice on a daily basis, as have many others through me. This photo was taken in 2006 in Frank Arjava Petter’s house in Duesseldorf, when I attended my first ever Jikiden Reiki training event with Tadao Yamaguchi. (Since then I have attended many). I am posting it here, because the sheer delight I felt on discovering Jikiden Reiki is palpably visible. Delight at the quality of the training and deep insight into the roots, nature and essence of Reiki practice in a way that was tangible and practical, and very much applicable, and to be applied to, everyday life. Beaming with energy after five days of learning with Yamaguchi sensei and Arjava sensei, feeling like a ball of blueish-whitish light. (I’m the girl grinning from side to side sitting to the right of Tadao sensei). Memories are flooding back as I see images of this year’s training with Yamaguchi sensei in Frankfurt popping up on facebook, with participants contacting me who have this incredible experience for the first time. Recently I had a nice surprise when colleagues on LinkedIn unexpectedly congratulated me on on 7 years of dedication to Jikiden Reiki. This struck me like a bolt from the blue, as time has just flown by since my first training in June 2006. There are definitely no signs of a 7 year itch as far as I’m concerned: I am as passionate about jikiden as ever. So what am I getting from my keen involvement with Jikiden Reiki? Let me warn you: the list is bound to be long. On a personal level: I am definitely not the same person I was before I discovered Jikiden Reiki. A couple of weeks ago a friend stopped me in the street to tell me about a conversation she had had with one of her children: Her primary school aged daughter had asked her if I ever got angry. Because the girl had only ever seen me with a smile on my face, she believed that I would probably even smile when telling my kids off. Although not quite true, this lovely story made me smile even more. I am no saint and I can definitely (although rarely these days) blow my top, but it is true that I feel (and therefore probably radiate) a quiet undercurrent of happiness most of the time. Like anyone else, my life has its complications and is by no means always easy. But I do feel quietly happy a lot, and I credit Jikiden Reiki for that. I love my work helping people return to physical and mental health with Jikiden Reiki treatments in my clinics in the Scottish Borders and in Edinburgh, and I love passing on these simple yet invaluable skills to others in my Jikiden Reiki courses and I love the effects the practice has on my life and on the lives of those around me. What other changes have I noticed about myself? Some of the qualities I have acquired through daily Reiki practice include patience, groundedness and more of an ability to see situations from multiple perspectives simultaneously; meaning I can better see and feel perspectives other than my own. When confronted with challenging situations, I don’t tend to panic and can usually think on my feet. Having been at the receiving end of two nasty scams last year and again this year, I don’t tend to waste much time or energy on negative states of mind such as getting angry or upset (although worry can be a little harder for me not to engage in), instead finding the people and tools that can support me in effectively dealing with the situation. Although I was lucky to receive a very good education and being naturally quite articulate, I don’t come from a privileged background, and have never been particularly confident (that is, unless I teach Jikiden Reiki). Being wired on the sensitive side and shy by temperament, I have been reluctant to reveal too much of myself. I remember with a chuckle how, when I first learned Reiki in 2003, I would keep this fact closely guarded private information only to be shared with the trusted few. This is funny, because several years later (and thanks to a process of constant, and sometimes painful, personal growth) I seem to have no choice but to fly by my true colours and to step out into the public domain bearing witness to what I know to be true. 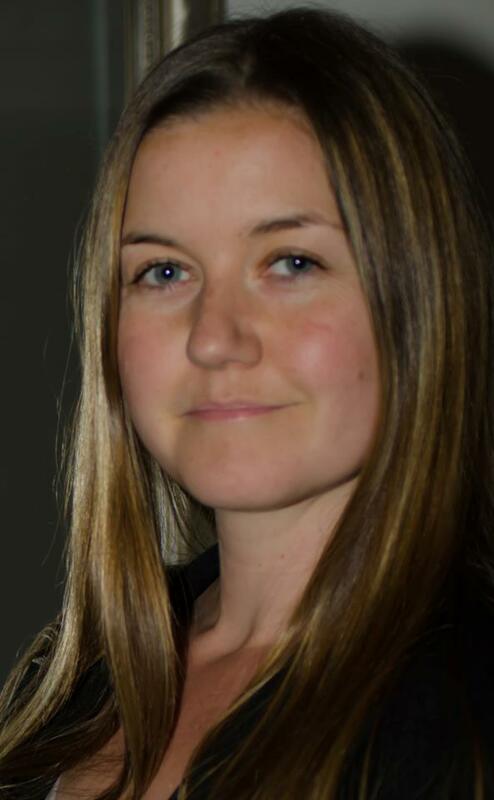 Wanting to share my my passion for Jikiden Reiki and its potential to help people live healthier happier lives, simply by tapping into their own, innate, healing ability. Recently my efforts to bring Jikiden Reiki into environments that at first contact may not always be open to energy healing (such as conventional medicine) again triggered my fear buttons, but having done so successfully, the experience is helping me to slowly, steadily and incrementally close the confidence gap. I am aware that I’m making it sound as if I had life all sussed, which is definitely not true. (However, for me, this makes a nice change from usually being hyper conscious of my shortcomings and failings). Just ask my friends and family and the people close to me for a long list of my flaws. All I am saying is that I have changed for the better since I became involved with Reiki practice, and I see positive changes in others, too. In my experience, the tools offered in Jikiden Reiki practice, such as the Gokai, giving and receiving physical Reiki treatments, reiju, Sei Heki treatment and hatsurei ho, as well as enabling us to practice Reiki for improved physical health, offer great opportunities for ongoing personal growth, too. Not without reason, it seems to me, has Mikao Usui named his method ‘Shin Shin Kaizen Usui Reiki Ryoho’ (Usui Reiki treatment method for the improvement of body and mind) and described the practice as his ‘secret method to invite health and happiness.’ What could be more holistic than finding your authenticity, your stable, unfazed core and your rootedness in compassion: all side-effects of dedicated Reiki practice. If you would like to benefit from the amazing opportunity to learn Jikiden Reiki directly from Tadao Yamaguchi, please contact me through this website. “As far back as I can remember, I have always sought balance and harmony in my life and nurtured a strong desire to, ‘make things better’ for my nearest and dearest. Whether calming babies or returning to flight, birds stunned against the window pane, being able to help others has been motivating and rewarding for me. However, in recent years, I had a growing feeling that there was more – more depth and breadth – to whatever it was I could do. A feeling that I was on ‘the cusp of discovery’, but had no idea what it was. Sometimes it really felt as if I could help someone with a headache or a neckache, but other times I wondered if it were my imagination or just wishful thinking? I’d heard about Reiki: been given insights and even a book recommendation by complete strangers as well as reading books that I’d come across quite by chance on my own. With this information, I realised that what I was trying to do was to connect with Universal Energy to help others get better, but I questioned whether I was on the right track, as any healing outcomes lacked consistency or confidence on my part. I needed guidance. A serendipitous visit to The Eastgate Theatre in Peebles put Gisela Stewart’s flyer about Jikiden Reiki in my path. Interest and curiosity piqued, I found on Gisela’s website that Jikiden means, ‘directly transmitted or passed down from one’s teacher’. 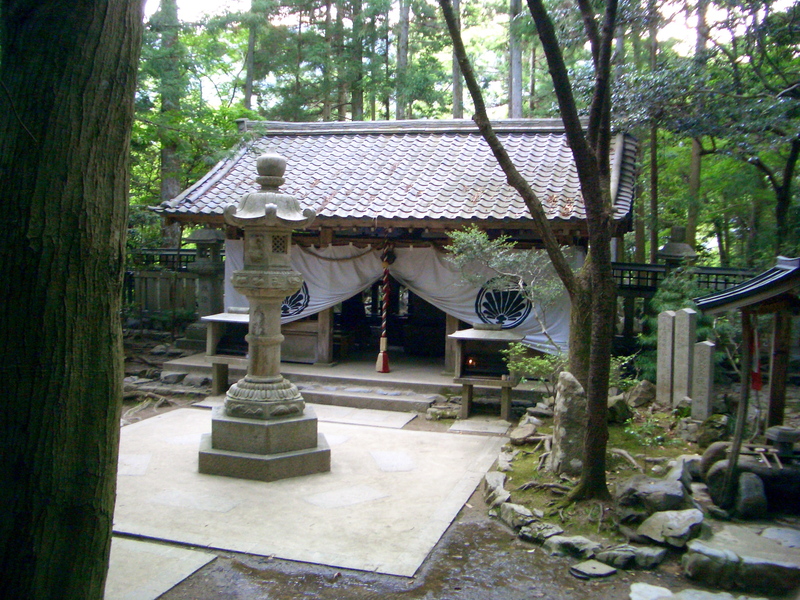 So, in the case of Jikiden Reiki, there is a direct lineage from the founder, Mikao Usui. The Jikiden Reiki being taught today is as close as can be, in clarity and simplicity, to the Reiki taught by Usui Sensei, Hayashi Sensei and Chiyoko Yamaguchi. This I found very appealing. And then, the exciting news that Tadao Yamaguchi, whom I’d read about in my research, was coming to Edinburgh to teach Shoden and Okuden. If ever there were a case of, ‘The Master appears when the student is ready’, this felt like it! 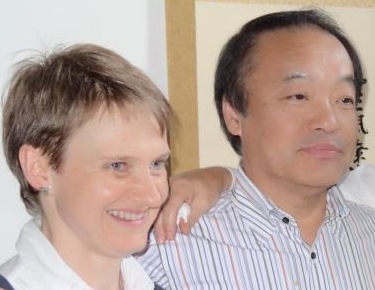 I contacted Gisela straight away to secure my place to study with Mr Yamaguchi. Next, I saw a portable treatment/ therapy table for sale in the small ads at my local supermarket. Another gentle shove along the path! The four day training course with Tadao Yamaguchi in Japanese, with translation by the delightful Dai Shihan (Teacher) Rika Tanaka, was a wonderful experience. Hungry for this new knowledge that I’d been searching for, I soaked up everything like a dry sponge. The others on the course, many of whom were repeating or had come to Jikiden via Western Reiki, were very warm and open people – their energy was palpable. It was wonderful to be in the same room with so many like-minded people and I felt instantly at ease. It struck me how accessible and ‘everyday’ Tadao Yamaguchi made Jikiden Reiki feel. With stories of how his Mother, Chiyoko Yamaguchi, gave healing to all members of the family when he was a small boy, he illustrated how Reiki was essentially the natural First Aid. There is very little ‘theatre’ to Jikiden Reiki – just immediate, effective help flowing in response to compassionate intention. Leaving the training sessions each day, I felt on a natural high: truly alive with a raised vibration. Centred, grounded and with improved balance, I felt better equipped to cope with anything and everything. 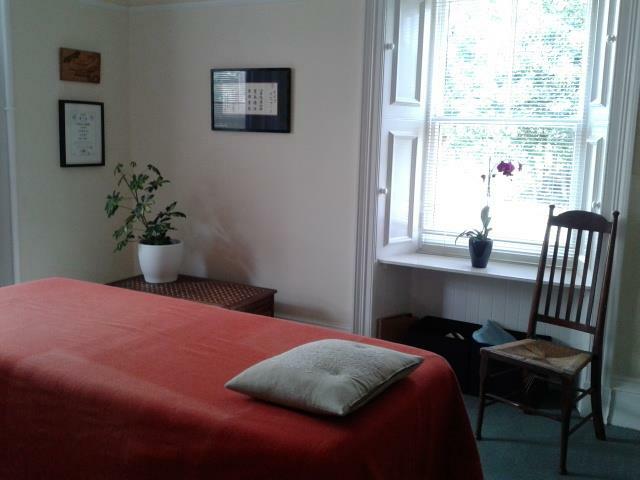 It really gave me confidence when Tadao Sensei said that it didn’t matter how long someone had been giving Jikiden Reiki, the healing energy flowing from a newly qualified practitioner is the same as from one with many years experience. What does increase with regular practice and experience is one’s ability to sense the levels of ‘Byosen’, the build up of toxins which are the likely cause of dis-ease in the body. Since training with Tadao Yamaguchi in August/ September 2012, I’ve felt privileged and able to help all members of my family, including our Border Collie who comes to me daily. I’ve also been able to help close friends who’ve been open to, ‘give it a go’ and have been delighted with the positive feedback. Distance healing, learned at Okuden level, has proved very helpful also: from treating a headche in the U.S., to easing a tender coccyx incurred snowboarding in the French Alps! I’ve been able to help calm agitation in palliative care and help to bring a sense of peace to a relative at distance as he experienced the passing of his Mother. It’s amazing to be able to feel that you can help someone even though you can’t be with them in person. Closer to home, my Husband has been the recipient of Jikiden Reiki healing on a regular daily basis. Just 3 months after I’d studied with Tadao Sensei, he slipped on the ice, falling badly and rupturing his patella tendon. Surgery was required to repair the knee and he was in a full plaster cast, then a high-tech brace for almost 3 months. During this time it has been wonderful to be able to help reduce the inflammation and ease the pain for him and for me, to feel, beyond doubt, that I really am assisting the healing process. At the time of writing this, he is just recovering from a second operation to remove the wires from his knee. He is now able to walk without any means of knee support. With physiotherapy and continuing Jikiden Reiki treatments he hopes soon to dispense with the crutches. In my experience there are no down sides: Jikiden Reiki benefits both the practitioner and the recipient of the healing energy. My own health and sense of well-being have improved and I feel more calm and less easily stressed. The more people who learn Jikiden Reiki, as is Tadao Yamaguchi’s Life Mission, the better for everyone in their community. 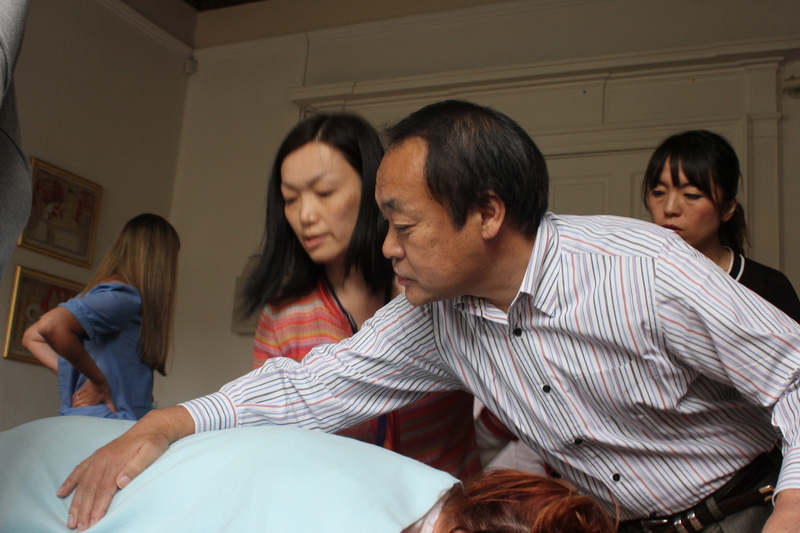 Tadao Yamaguchi is coming over from Japan to Edinburgh to teach Jikiden Reiki in September. For more information about this unique opportunity to learn Reiki directly from Mr Yamaguchi and to benefit from his close connection to the original teachings and his extensive experience, please contact Gisela through the contact form of this website. For training in London, contact Rika Tanaka. Anyway, my language course tells me (and I’ve heard this before) that “you won’t hear Japanese people use first names often, except within the family or between close friends.” How generous of Tadao sensei (and formerly Chiyoko sensei) to treat their students as family. I love the community building aspect of Jikiden Reiki. From each Jikiden Reiki seminar I have attended (and that’s quite a few since I first discovered Jikiden in 2006), I have come home having made new wonderful and lasting friendships. I also love the humility of a teacher who keeps pointing his students to the potential within themselves and knows that this can be realised with the help of reiju and a little dedicated effort. This is what Tadao Yamaguchi sees as Mikao Usui‘s legacy. Even beginners can use Reiki successfully. Tadao sensei’s mother, Chiyoko Yamaguchi, who had learned Reiki from Chujiro Hayashi at the tender age of 17 and had practised on a daily basis for over 65 years, used to stress that the Reiki coming from her and the Reiki coming from you and me is the same energy, and that perhaps the only advantage an experienced practitioner has is that they may feel the body’s healing response a little more easily. 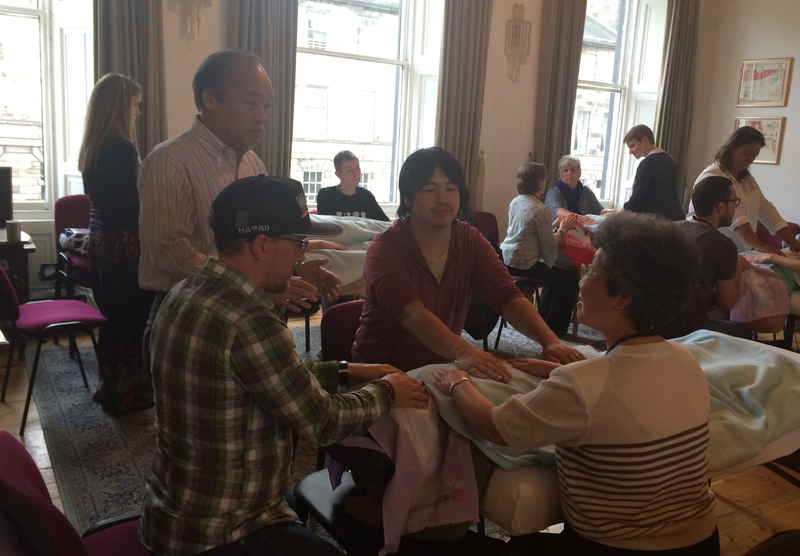 At the recent training in Edinburgh, Mr Yamaguchi emphasized that with lots of practice, any practitioner can get to this level within half a year or so. To me, this feels both humbling and incredibly matter of fact, the reality of someone who deeply appreciates Reiki, having grown up nurtured by it from before birth, but to whom energy healing is also as natural as water and air. No need to make a fuss or be all mysterious. Since in essence, Reiki is completely natural, in harmony with nature, and everyone’s birthright. Therefore, from a purely Reiki point of view, there are also no reasons not to give Reiki. The ability to do so is completely natural, too, and part of being human. Most of us simply need a gentle reminder of what is already there. 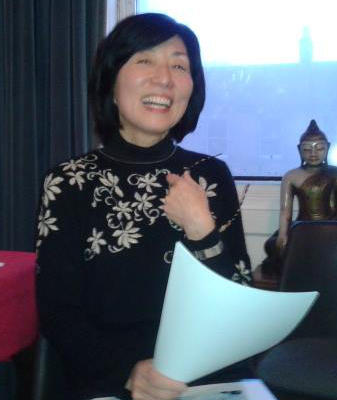 One of my students commented that training with Tadao Yamaguchi to her felt much more ‘serious’ than attending a seminar with Amanda Jayne or myself (the content of Jikiden Reiki seminars always being the same of course, regardless of who is teaching). It’s true, Tadao sensei definitely has gravitas. 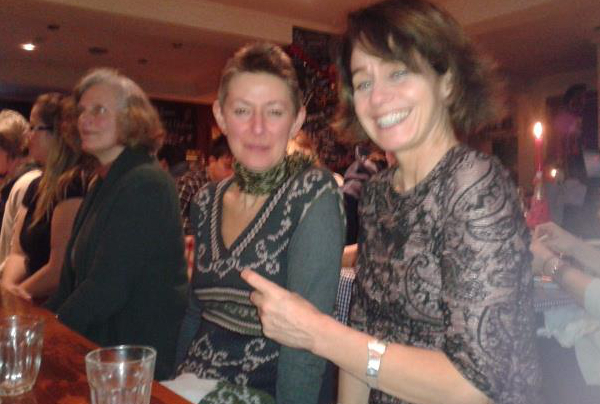 But also so much lightness and humour. Attending training with Tadao Yamaguchi and Rika Tanaka, in my experience, is always highly instructive, and also so much fun. In Japan, the student teacher relationship lasts a life-time, and in 1930s Japan, students would meet up with their teachers once a month if they could. They also repeated the seminars several times, to consolidate their understanding of the content and to receive further reiju. (Tadao Yamaguchi has many photographs of the early seminars with Chujiro Hayashi which prove this). The concept of repeating the same training can at first seem strange to students from Western countries. However, practitioners who have done so invariably comment how much they had missed first time round and how their understanding has deepened. As the feedback from the Jikiden training with Tadao Yamaguchi keeps coming in, I find myself thinking about what it takes to be a student of Reiki. The founder of the practice, Mikao Usui, deliberately placed himself on the second rung of the achievement ladder, there always being more room for growth and development. And really, how could one ever be anything other than a student of Reiki? Nonetheless, I have a lot of respect for teachers and practitioners of long standing experience with westernised Reiki (sometimes 20 years or more) who have the humility to go back to the Japanese roots of the practice, and it’s always nice for me to hear when they find the experience rewarding. 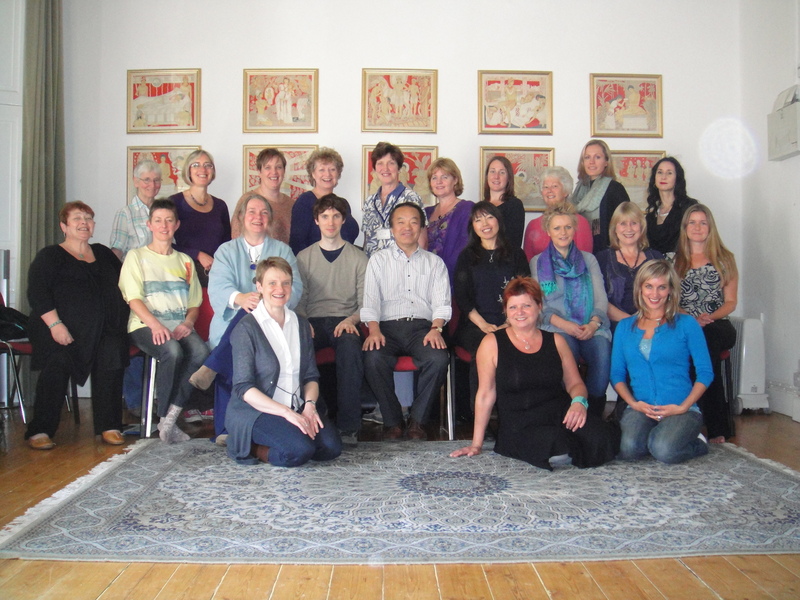 Tadao Yamaguchi will be a guest speaker at the Mindful Peace Forum in Dundee on Friday. “Reiki ~ the most natural thing in the world.” This is how I would summarise the essence of Jikiden Reiki and the jikiden approach to Reiki. Passing on the teachings of Dr. Chujiro Hayashi, Reiki is seen as essential, perfect human nature, in harmony with creation. Reiki as a healing method and as a spiritual path helps find the way back to this pure state. Step by step ‘as if peeling thin layers of paper’. Physically, Reiki energises the body so that the natural cleansing processes can function optimally. Having grown up with Reiki from an early age, for the Yamaguchis Reiki is as natural as water and air, yet something deeply appreciated. This is the sense I get yet again while rereading Tadao Yamaguchi’s book ‘Light on the origins of Reiki’. Related reading: Is Reiki physical or spiritual? At a recent UN High Level Meeting on Wellbeing and Happiness, discussion turned to how the concept of Gross National Happiness (an innovative economic model originally developed in Bhutan, a Buddhist country with a longstanding tradition of mindfulness) could be applied to the rest of the world. Discussion inevitably turned to the difficulties faced by undertaking such a task on such a grand scale. When the forest was on fire and all of the animals were fleeing around her, the hummingbird was ferrying droplets of water in her tiny beak, one by one, to try and staunch the flames. “What are you doing?” her distinguished animal colleagues asked. “The best I can”, replied the hummingbird. As Reiki practitioners, we are armed with such a wonderful healing resource in the palm of our hands. By nature, we tend to be a compassionate bunch who are sensitive to the suffering of others. The desire to help and to ease the suffering of others is often strong. Starting out with the best of intentions, we can soon find ourselves overwhelmed and burnt out. An image of a stressed out Reiki practitioner providing distant treatments to many people simultaneously at the end of a long day springs to mind. So, what can we do to avoid this and to deliver a sustained and healthy level of service to others through our Reiki practice? 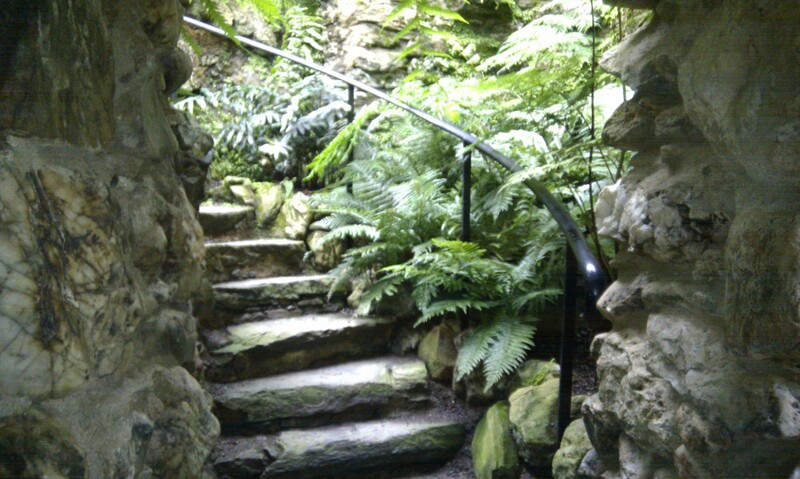 The answer, from a Jikiden Reiki perspective, is one step at a time, one person at a time. We are taught to start with ourselves, our family and friends, then moving out into the community around us. We are not taught methods for sending distant Reiki to many people simultaneously, or to specific areas or disaster situations. Just one person at a time. I remember, at a Jikiden Reiki seminar, a Reiki practitioner asked Tadao Yamaguchi, the Head of the Jikiden Reiki Institute in Japan, for advice on someone they were treating distantly for a serious illness. This person lived many, many miles away and the practitioner did not know them personally. This practitioner was actually asking about specifics of the treatment approach, but Tadao Yamaguchi politely asked “Why are you treating this person so far away? A fruitful discussion developed between the participating practitioners, resulting in a contact being made with a Jikiden Reiki practioner who lived locally to the person needing help.The point was not about never sending distant Reiki to people we do not know, or to those far afield. It was about keeping things simple, being practical and drawing on the resources of others if required. This is something I personally value very much about Jikiden Reiki. The approach is very humble, straightforward, simple, grounded and manageable. One person at a time, being relaxed, doing the ‘best we can’.